The Toyota Echo replaced the Tercel as Toyota’s small car in America; Europeans and Asians knew it as the Yaris. The Echo was based on the same platform as the Prius, but had a smaller wheelbase. In theory, the modern design should have made it less expensive and a better deal, but while performance was a little better on paper, it didn’t live up to its expectations and was eliminated after a relatively brief period. The basic car, redesigned, came back as the Scion and Yaris. When Toyota announced the Echo, we were somewhat confused by the specifications. It looked as though the Echo was going to be as fast as the Corolla, and large inside, and, of course, as reliable; so why would people still want a Corolla? When we drove the Echo, we quickly found out that it is aimed at different buyers than the Corolla, and, for that matter, the first-generation Prius on which the Echo is based. While the Prius and Echo share a basic body, and look almost identical, the Prius has a better looking interior, better sound insulation, a more powerful engine (which gets better mileage), and substantially more interior space - coupled with a starting price double that of the Echo, albeit including many "standard options." Compared with the Corolla, the Echo has a generally cheaper feel inside, though that is more a matter of fabrics and such than of quality. The Echo feels as high-quality as any other Toyota, which would make it a standout in the under-$12,000 class. 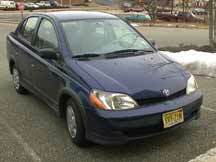 Though the small engine can hurtle the Echo to sixty in about the same time as it takes the Corolla to get there (just under ten seconds with the automatic), it is extremely slow when out of its power band, and the automatic transmission is slow to change gears to get acceleration, making passing hairy at times. The little car can easily make it to illegal speeds, and can accelerate while there, but feels underpowered compared with the Corolla. So much for the traditional acceleration spec of zero to sixty. Gas mileage is similar to the Corolla, matching five speed to five speed, though we believe we exceeded EPA estimates despite fast driving. With the automatic, the Corolla does even better relative to the Echo, so there's not much economy there. The interior looks like, well, a Prius interior with cheaper guages and switches substituted for the electronic displays and thermostatic controls. The tiny instrument panel, up in the center of the car, is easy to get used to, and is easier to read quickly than traditional panels. However, a temperature gauge would be nice - the idiot light tends to wash out, and doesn't really give much information. Likewise, a tachometer is really needed for such a small engine. 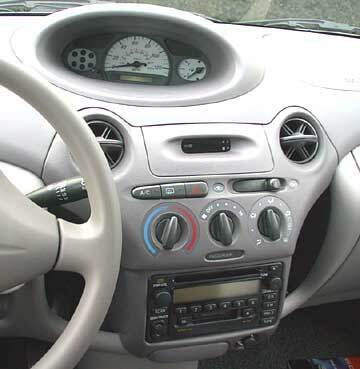 Other controls are all sensible and include a well designed cruise stalk and door lock buttons placed sensibly on the door if you get electric windows, and oddly in the center console if you don't. The high ceiling means that tall people can actually feel comfortable, and that average-height people get a feeling of space inside. However, front-to-back room is sparse, so that back seat passengers have very little leg room. The trunk is fairly large, and there is plenty of internal storage. We especially liked the innovative storage areas on both sides of the center stack. Cargo room is good for the class. It is very easy to work the clutch, but the stick tended to be balky. The engine is peppy when in the right gear. Wind noise is high but not excessive on the highway, and the vent fan is relatively quiet thanks to innovative vents. Handling is good for a car of this class, not up to the Rio's standards, but certainly capable of coming up to most drivers' needs and expectations. Body roll is surprisingly low given the "tall car" stance, but understeer can be a problem, especially on initial acceleration when torque steer takes hold. The ride is very good for the price class, though it tends to jiggle on rough surfaces, and braking seems good. This would be a very fun car with a little suspension tuning and a Corolla engine. While the heat seemed powerful after the engine warmed up - which took quite a while - the air conditioning is below average. The stereo is mediocre, though not much more so than the Corolla's. The 1.5 liter engine pumped out 108 hp at 6,000 rpm, 105 lb-ft at 4,200 rpm - a rather high power band. Gas mileage was rated by the EPA at 34 city, 41 highway; the optional automatic brought that down a little to 32 city, 38 highway. Real-life mileage was actually considerably lower for many drivers, and the Corolla could exceed the Echo’s mileage for those who demanded more acceleration. Base price was quite low at $10,000, stripped two-door, rising to $11,325 for a four-door automatic; a mandatory delivery charge of $455 was added to those, and most people got some sort of options, which could raise the price of the Echo into base Corolla turf rather quickly. (The base Corolla came with more standard features - the Echo didn't have a standard cassette player or power steering). Overall, the Echo is a bargain if you buy it with few or no options, but even a few common options quickly raise the price to Corolla levels. The Corolla has a nicer interior and more refinement, though it loses a little of the raw "fun factor."